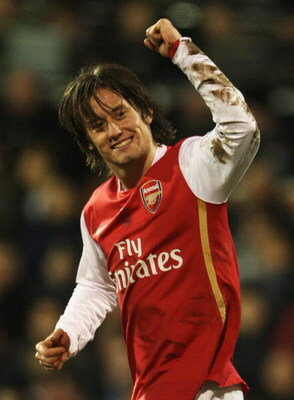 It may only be pre-season, but Saturday will be a special day for Tomas Rosicky. After a long absence that seemed to jeopardize the talented midfielder’s career at Arsenal, Rosicky will return to the lineup at the Emirates when Arsenal kickoff the Emirates Cup against Athletico Madrid. There is more good news prior to Saturday’s match. Gael Clichy will make his pre-season debut despite erroneous reports that he might miss the start of the season due to injury. Clichy is a very talented player whose occasional lack of focus has cost us crucial points over the past two seasons. His slip against Sp*rs last season allowed them to tie the game in a soul crushing 4-4 draw at the Emirates. But his worst gaffe came at Birmingham City the prior season when his sloppy give away and subsequent penalty (which wasn’t) allowed Birmingham to tie the match, steal a point, and ultimately sink our title hopes in a match that also cost Eduardo a year of football thanks to a horrific injury. As talented as Clichy is and as much as the Arsenal faithful support him, he must eliminate these mental lapses this season. There’s no denying Kieran Gibbs development and hopefully that will push Clichy to work harder to keep a position where that was no previous competition. Speaking of Kieran Gibbs, he will be absent from the Athletico match, along with his England U-21 teammate Theo Walcott. Both are missing due to a lack of training time. That leaves only Samir Nasri and the paper mache Abou Diaby missing through injury. (Something that comes as a surprise to absolutely no one.) For the most part, the team is healthy, and that’s good news. Nasri’s absence is a loss, but if everything goes according to plan, it will be a shorter absence than originally believed. My biggest concern over his absence is the unique importance of this preseason. In the past, Arsenal have consistently lined up in a 4-4-2 and the players seemed largely comfortable with their respective roles. But with Arsene Wenger looking at a possible change to a 4-3-3, it is critical that each player learns their new position and responsibilities. It’s also important for Wenger to identify the best position for his players and his first-choice lineup. With Nasri out until the season is well underway, it’s impossible to know if he’s going to remain a wide player, or reprise his late season role as a holding midfielder. I suppose there’s nothing that can be done about that now. Of all the transfer rumors, only two have even the scent of credibility. I wouldn’t be surprised if we do sign Chamakh. Without being redundant, he is the quintessential Wenger transfer target and fills the void left by Adebayor. Right now, Bendtner is really our only arial threat and Chamakh would add some much needed hight to the front line. He’d probably be a squad player, but I still think he fits the mould. The other rumor that’s gaining steam is the return of Patrick Viera. This one is tricky for several reasons. First, it started with a former Arsenal great suggesting that it was in the works without any supporting evidence. That seemed innocuous enough. But whether for his own amusement or as a sign of things to come, Wenger himself contributed to the rumors with his statement that he was considering the “psychological” effect of bringing Viera back and that Viera would choose Arsenal over any other English team. By addressing the Viera rumors, Wenger has turned this into a genuine possiblity. The question is whether the move would be advantageous. I’m probably going to get in trouble here, but I don’t want Viera to come back. He’s an Arsenal legend. His Arsenal legacy is secure and beyond reproach. The last thing anyone wants to see is an older, less agile Viera struggling to keep up with the English game while contending with niggling injuries. I don’t want his reputation at Arsenal to include this “fat Elvis” period. I don’t need to see him in his “Michael Jordan with the Washington Wizards” period. His experience and leadership might help the younger players. But it also might serve to undermine Cesc’s ability to truly take the reigns as Arsenal captain. And considering how disruptive injuries can be to the continuity of a season, and how we struggled with that last season, the last thing we need is a player of massive stature coming into the team who’s always a risk for long term injury. We all admire and respect Viera and he will always be an important part of Arsenal history. But as far as I’m concerned, I’d like him to stay that way. And that about does it for this week. Now we sit back, and enjoy the return of Arsenal football to the Emirates. More important than the performance of the individual players, is the development of our new formation. Has Wenger settled on a 4-3-3? We should have a much better idea after this weekend.